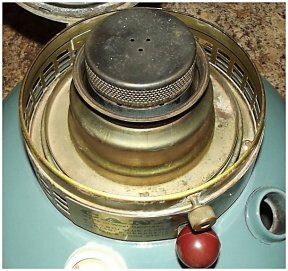 There are quite a few old heaters and center draft lamps for which factory wicks have not been available for many decades. 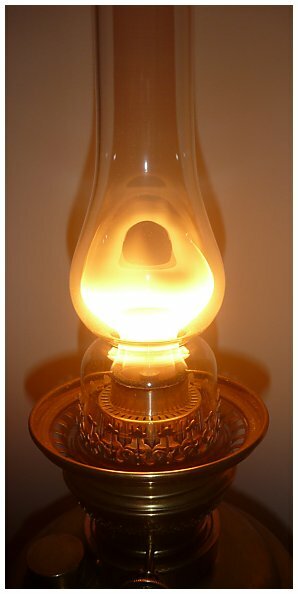 The heaters and lamps can often be in excellent condition, they simply cannot be used due to the lack of a suitable wick. I can make wicks that will work for many of them. They are not as pretty as factory wicks - but the work well and nothing else is available. All edges are sewn and the circular wicks have smooth seams for even burning. These wicks are custom sewn by hand using quality wick material of the proper thickness. These wicks are supplied with illustrated installation instructions. I measure wick thickness with Ames Thickness Gauges to ensure the correct wick material is used when making wicks of the correct measurement for your lamp or heater. 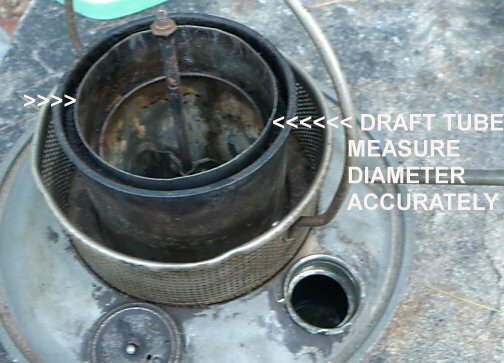 Remove the burner/gallery and measure the height of the draft tube with a thin stick like a bamboo skewer. That length plus 1" is the proper wick length. 2 61/64 (2.952''), 75mm width x 8'' long for Electrolux fridge using a flat wick 75mm wide. Measure old wick first as there were other models! 3.54'' wide (90mm), 8'' long, 0.102'' thick for L&B Belge_20''' Matador. 90mm wide, 0.108'' thick flat wick. 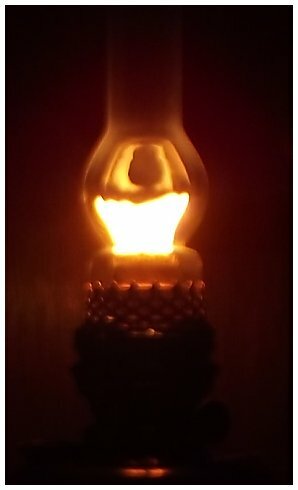 3 5/8'' (92mm) wide, 0.108" thick for 20''' DHR Matador and many other 20''' Matador lamps using my new neoVulcan chimney. 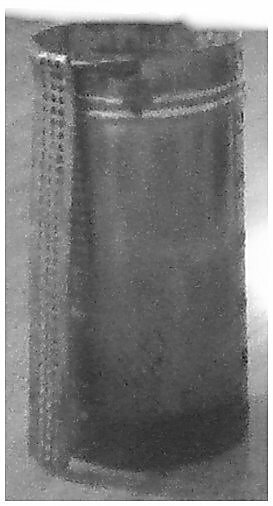 5.0" wide, 0.095'' thick wick for Stokoe & other stoves which used a thick, flat wick. Can be trimmed to a smaller width at same cost: email me with the exact width desired. 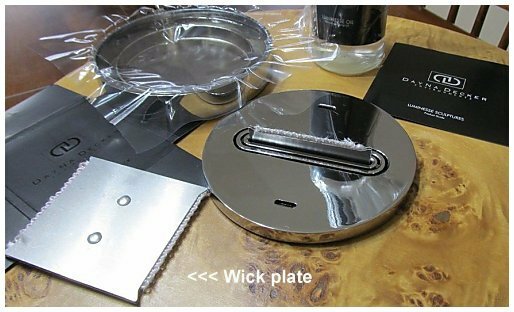 DayNa Decker Lamp, convert wick plate to accept replaceable long-lasting fiberglass wicks. You must send me the wick plate to be altered. Wick plate with new long lasting fiberglass wick installed is returned via trackable Priority Mail. Once converted the wicks below can easily be user installed. Email me for details. 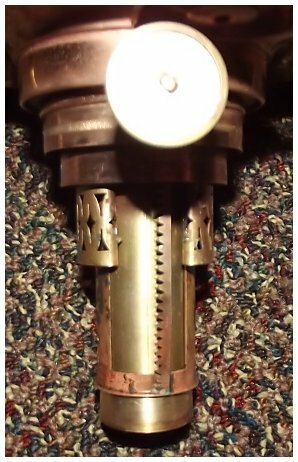 What I need to make a wick for a student lamp is the flat width of any remaining wick fragment and/or the diameter of both the center draft tube, the attachment sleeve, and the inside diameter of the outer wick tube. 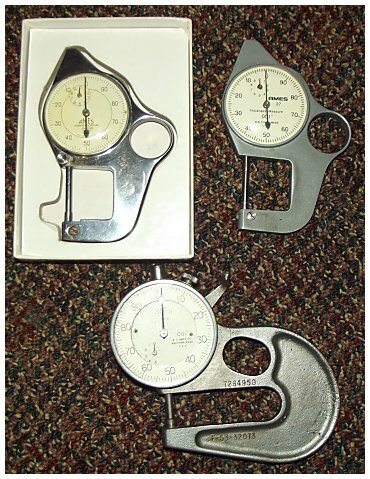 Measured diameters - with calipers! "Eyeball guesstimates" or ''it looks like'' are worthless. 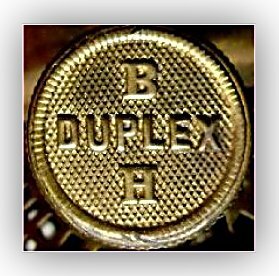 B&H_Student Duplex Lamp wicks, 1 1/8" wide, 0.075" thick, by the foot for short lengths. 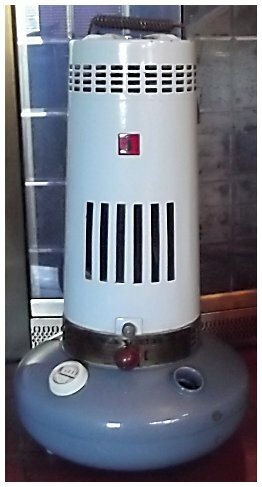 German Student Lamp Co, Imperial Model. 4.5'' L, 2'' wide. Draft tube inner ring is 1.065'' diameter, outer ring 1.301'' diameter. Existing wick fragment would be 2'' wide. Wick is 0.076" thick. Manhattan, Miller* & Kleeman Student Lamps. 1 1/4''; flat X 4.5''; long. Wick is 0.055'' thick. Existing wick fragment would be 1.25'' wide. 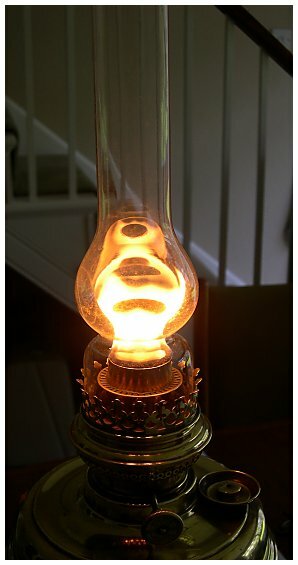 Miller Student lamps using Vestal burners used wicks #0S, #1M and #2M. 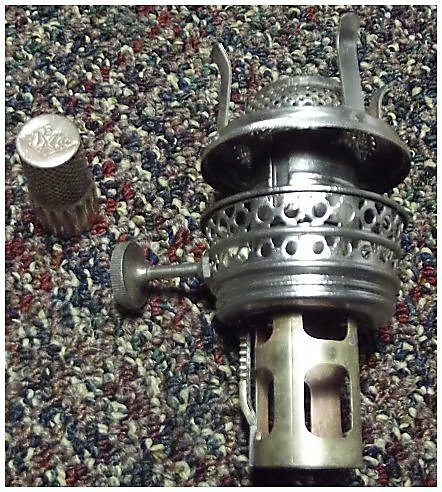 The wick knob was on the burner itself as with other Vestal burners and used a flame spreader. 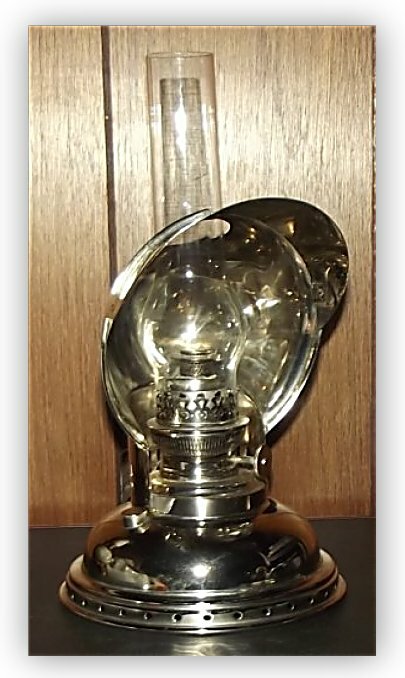 A more complete list of CENTER DRAFT LAMP WICKS NO LONGER MANUFACTURED is shown at the bottom of this page. Click here. 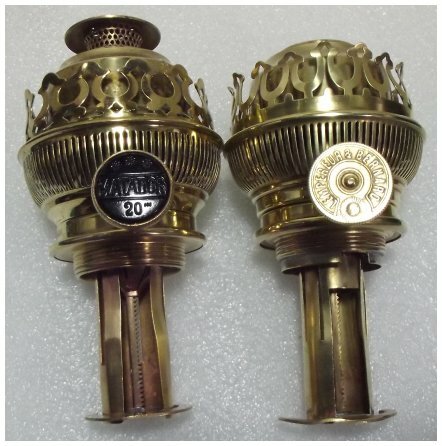 See the Globe Vulcan page for more information on these unusual lamps & wicks. My custom wicks are made using original wicks as samples for diameter, width, and thickness of the burning section as well as thickness of the "tails" for proper capillary action to sustain a full burn as originally designed. They do not look the same as original Vulcan wicks because that is impossible without the original looms, but they fit and function just as well as the original wicks. Perfectly even flame with custom wick. 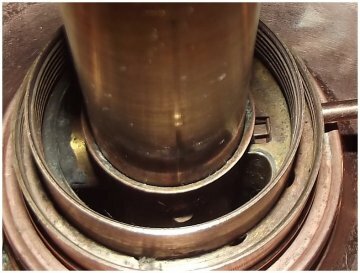 The wick pockets in an 18''' Globe/Central Vulcan burner. The "tails" of the wick must precisely fit those wick pockets and the wick guide pockets below. Above, Rob Gregor's 18''' Central Vulcan with full curl burn with my custom wick. 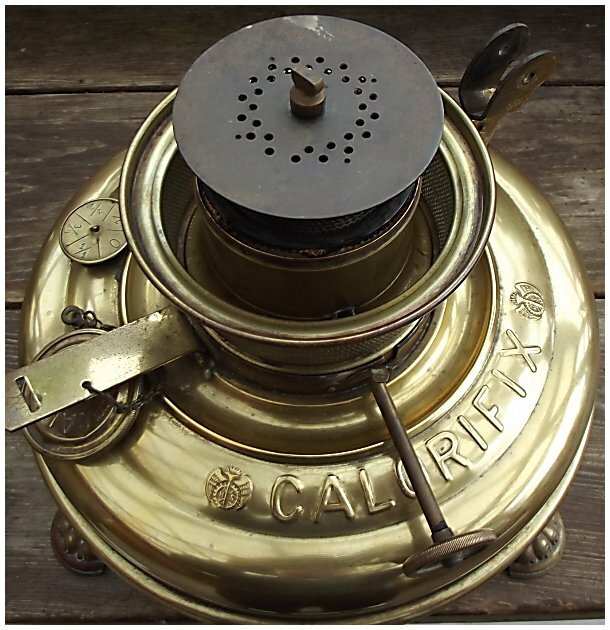 Alex Marrack's test of the my 18''' Central Vulcan wick: "Yes, it is 'as good as old' .. worked to the bottom of the fount without flagging flame or burnback of the wick." new custom wick in wick sleeve, above. #6Z 2 15/16'' (75mm) diameter wick (#6, #6A, 6X, 24) for those who wish to burn an all-cotton wick with diesel fuel. Not guaranteed as diesel fuel varies. All-cotton wick to replace fiberglass wicks #6X, #9A, #19, #24, etc. Custom wick using thick cotton woven wick material. 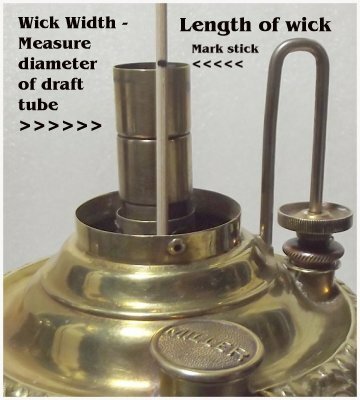 To see list of heaters using wicks #6, #6A, 6X, 24, click here. #1Z 3 3/8'' diameter wick (#1X, #2) for those who which to burn an all-cotton wick with diesel fuel. Not guaranteed as diesel fuel varies. 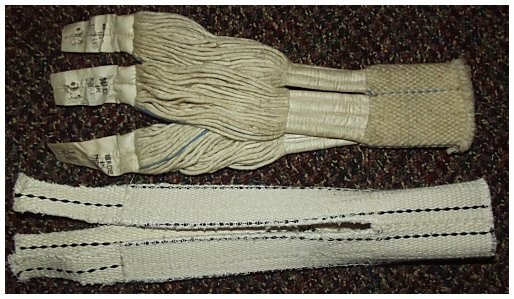 All-cotton wick to replace fiberglass wicks #1X & #2. Custom wick using thick cotton woven wick material. 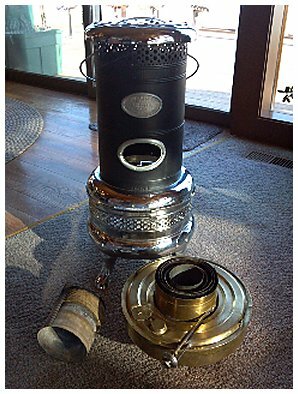 #3L 2 9/16'' diameter all-cotton wick to replace fiberglass wick #4E for those who want to try burning diesel fuel with a pint of alcohol per gallon in a Heat Mate/Sengoku HMN/CTN-110 radiant heater. Not guaranteed as diesel fuel varies in oil content. Wick #3L commercial factory wick. 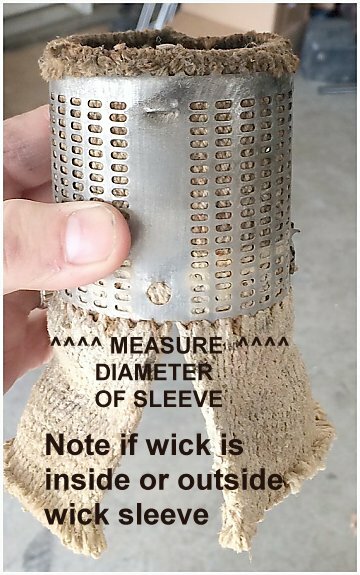 #7Z 3 3/4'' (95mm) diameter all-cotton wick to replace fiberglass wicks #7X and #27 for those who want to try burning diesel fuel with a pint of alcohol per gallon in an Alpaca, Fujix or similar heater. 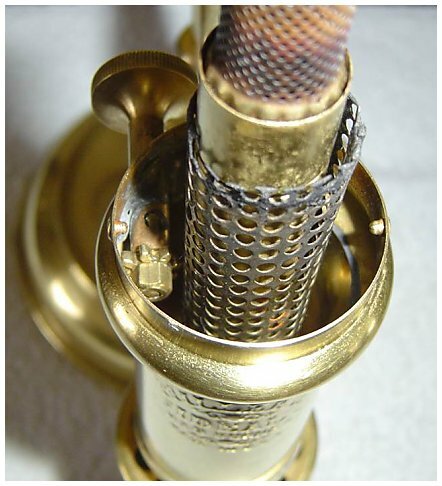 To see list of heaters using wicks #7X & #27, etc, click here. #5Z 4 1/8'' (105mm) diameter all-cotton wick to replace fiberglass wick #5. No pins! Does not replace with #5C. Not guaranteed as diesel fuel varies. #8Z 4 3/4'' diameter wick, UNPINNED, for those who which to burn an all-cotton wick with diesel fuel. Not guaranteed as diesel fuel varies. All-cotton wick to replace fiberglass wicks $3 and #8. Custom wick using thick cotton woven wick material. WILL NOT WORK TO REPLACE PINNED WICKS SUCH AS #3C OR #8B. B11 Buhl No. 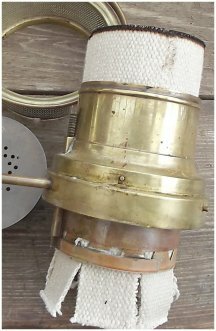 11 kerosene heater, 3" diameter wick sleeve. 38805 Clarus Heater using No. 38805 wick. Cotton replacement wick. 124 Florence H-124 & EZ # A512 & # 1212; & Sears #103.75202 Replacement wick, wick only, for use in your existing wick sleeve of 4 1/4" inside diameter. 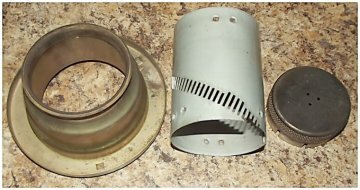 (Draft tube is 3 3/4'' diameter). Wick is 6 1/8'' wide when pressed flat. Sewn to wick sleeve as with Florence #3L wick. Wick is custom sewn by hand using quality wick material of the correct thickness. 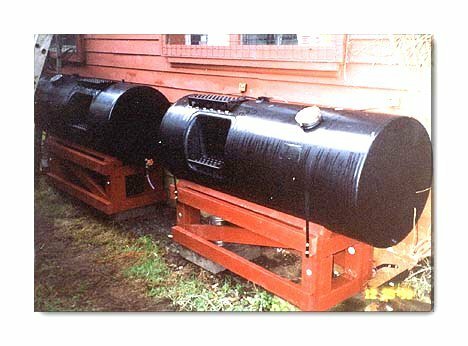 100C Hi Seas 100C marine diesel heater. 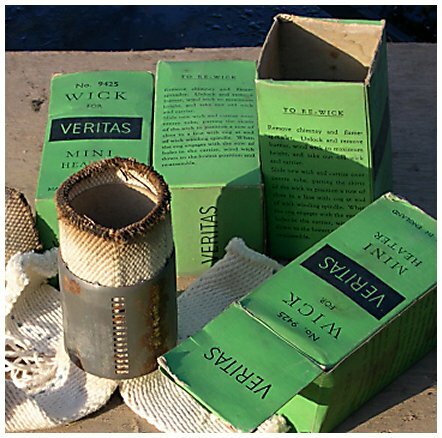 ASBESTOS wick. This wick is available. NESCO GIANT 505 & 605 and Wards D-151. Wick sleeve is 4.75 id, 5" tall. 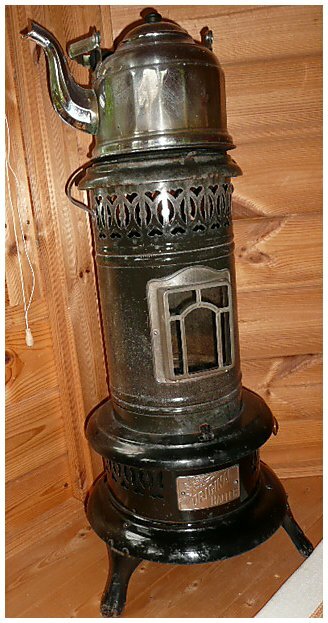 44 Puritan 44, 1895 heater. Tubular wick is 3 3/8'' wide measured flat, with two tails. 800 Superior 810, 815, 840 heater, 8" replacement wick, wick only, for use over your existing wick sleeve of 2.55''; diameter. 900 Superior 910, 915, 920, 15" heater replacement wick, wick only, for use over your existing wick sleeve of 4 3/4" diameter. 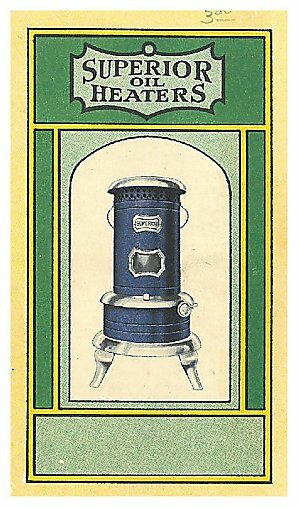 Also for the Ypsilanti 76.1 heater and Newark Stove Works # 215 Acme. 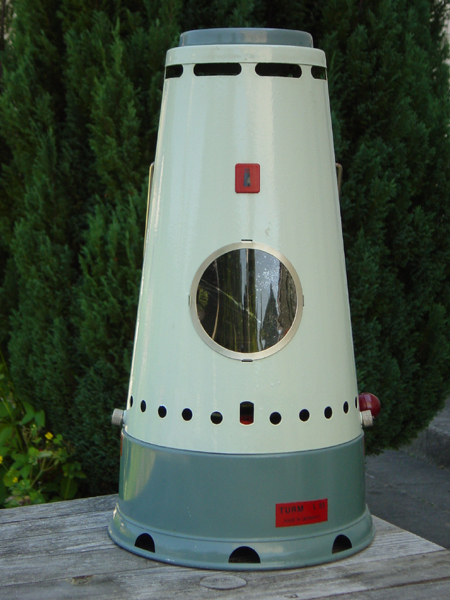 L51 Turm L51 Blaubrenner (Blue Flame Heater) (German) Sold in the US as a "Swiss Tent Heater." Wick only for use in your wick sleeve. Inquire. Video of heater burning > http://www.youtube.com/watch?v=UZWZBm5Jfvs Photo of heater > http://www.prela.ch/images/Turm2Gross.jpg Installation instructions included. 9425 Veritas Mini-Heater No. 9425 (photo here). Wick only for use in your wick sleeve. 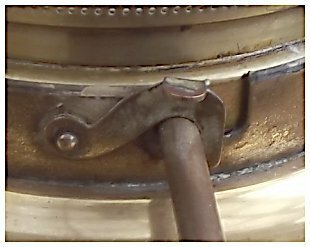 A more complete list of CENTER DRAFT LAMP WICKS NO LONGER MANUFACTURED is shown at the bottom of this page. 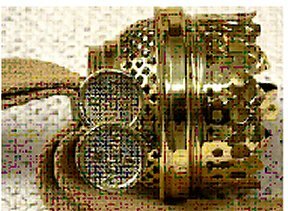 Samovar wicks: Send dimensions of draft tube and wick carrier. 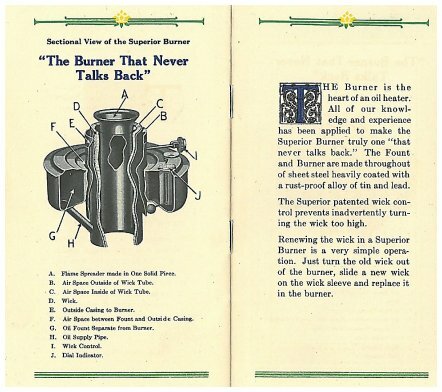 At left, pages from an original Superior Heater brochure. 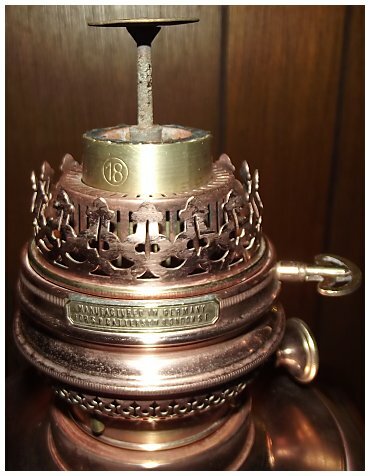 Wards Porto heater wick sleeve, 2.6'' diameter. The wick sleeve is upside down in the photo. Some have substitutions and the rest I can make on special order.